Chinese automaker Geely has taken the wraps off an all-new brand it’s taking global. 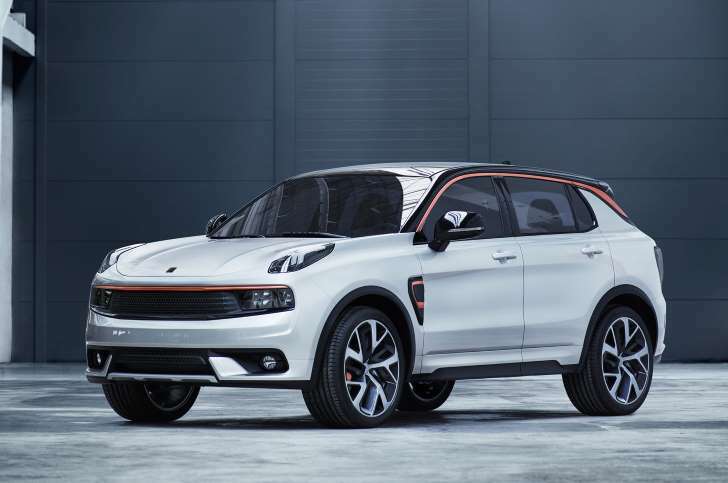 The unusually named Lynk & Co will combine Chinese financial and manufacturing muscle with an international team of designers and engineers based in Sweden to produce a unique range of high-style, lavishly equipped vehicles aimed to compete with mainstream products from GM, Ford, Toyota, Honda, and Hyundai in the U.S., Europe, and China. The first Lynk & Co vehicle, an SUV called the 01, will make its debut in China in the fourth quarter of 2017, and launch in the U.S. and Europe in 2018. By 2021 the Lynk & Co range will total four vehicles, and include a three-box four-door sedan, a five-door hatchback, and a crossover. There are whispers that a fifth model, a high-performance, all-wheel-drive Subaru WRX fighter, is also in the product plan. The new Lynk & Co vehicles will be built on the modular and highly flexible CMA hardware developed by CEVT, the Gothenburg-based company formed by Geely to create platforms and technologies for its automotive brands. The CMA architecture will also underpin the new Volvo XC40 compact SUV that’s due to appear next year, as well as the next-generation S40 sedan and V40 sedan. Engines will include the transverse-mounted 1.5-liter three-cylinder and 2.0-liter four-cylinder units developed by Volvo and licensed to Geely, available with either a conventional stick shift, or a dual-clutch automated transmission developed in-house by CEVT, and in front- or all-wheel drive. All Lynk & Co models will also be available with hybrid and plug-in hybrid powertrains, and the CMA architecture allows for pure electric versions to be built as well. CEVT chief Mats Fagerhag said the goal for Lynk & Co was to have vehicles with Swedish safety, German ride and handling, and Silicon Valley technology and connectivity. Volvo’s long history of safety innovation means all Lynk & Co models will achieve top scores in all U.S., European, and Chinese crash tests, said Fagerhag, and standard safety features will include 360-degree camera views, forward collision warning, rear cross-traffic alert, and autonomous emergency braking. Dynamically, Lynk & Co vehicles will “compete with the best models in the class” with engineers focusing on delivering responsive yet reassuring steering, good body control, a calm and comfortable ride, and stability, along with a quiet cabin. “We want a premium driving experience,” Fagerhag said. The Lynk & Co 01 is a well-proportioned SUV, about the size of a Nissan Rogue or a Jeep Cherokee, with structured, muscular surfaces. Signature design elements that will appear on other Lynk & Co models include the LED daylight running lamps on the horizontal surfaces at the forward corners of the front fenders, the full-width grille with discreetly disguised headlights, and what Horbury calls a “shark’s fin” graphic on the rear pillar. The 01 also features a strong greenhouse graphic that allows for a range of color treatments, including a different-colored roof. At the rear is a black band with Lynk & Co in expensive-looking chrome lettering. Lynk & Co sprung a last-minute surprise for journalists attending the preview of the 01 SUV – the reveal of a low-slung four-door sedan concept. Much of the car is auto show eye-candy, but its purpose was to show how the design cues from the 01 SUV could be repurposed in a totally different way. The Concept’s apparent dash-to-axle makes it look like a rear-drive car with a longitudinal engine. But that’s because CMA allows the designers to move the base of the windshield back relative to the front wheels without affecting that crucial dimensional relationship between firewall and axle under the skin. It’s basically the same visual trick Volvo pulled to make the S90 sedan look glamorous. Expect to see elements of the Concept’s design in the Lynk & Co sedan when it appears sometime before 2021.